Uhe's painstakingly authentic analogue emulation is pretty demanding. Is she worth it? Not quite an MS20 — its envelopes weren't the best ever, so here are a couple of alternative choices and let's bung in a Juno high-pass filter too. In the cinema and in the studio, the gap between real and digitally created experience narrows each year. For many, the convenience, affordability and flexibility of modelled reality already trumps those final few percentage points of difference. Uhe's Diva is proudly advertised as a 'game-changer': a software synth sounding so analogue you'll need to replace its capacitors in 30 years or so. Its main components resemble those of half a dozen classic instruments and it boasts enigmatic 'zero-delay-feedback' filters. 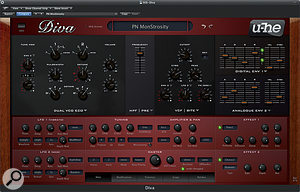 But such realism has a cost, and in its highest resolution mode ('Divine'), Diva needs a pretty powerful computer to hit the 16-voice maximum that it can deliver. 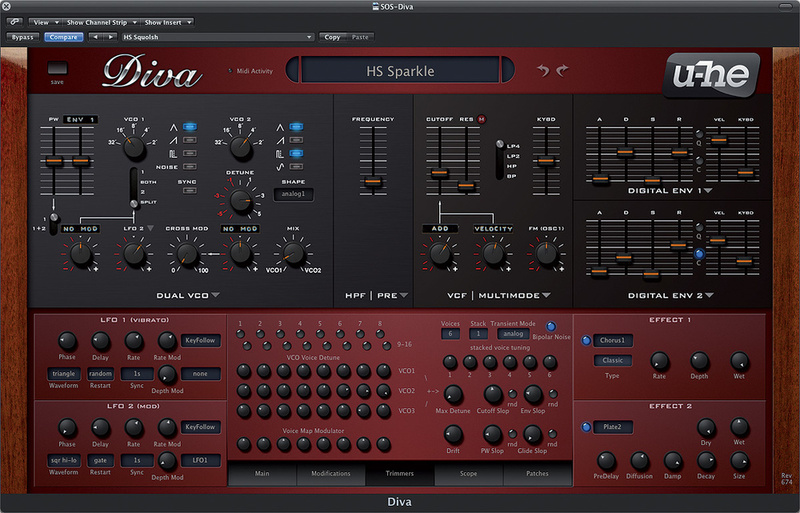 It's rare that a new plug-in feels instantly familiar, but Diva achieves this by sneakily borrowing important bits from a number of well-known synths. With one exception I've owned them all at some time or other, making this one of the briefest sessions of 'getting to know you' ever. But what are these classic analogues from which Diva's inspiration is drawn? The manual doesn't say explicitly, but the hints are easy to follow, and if you need more clues, Diva's panel graphics and 'Init' patches should sort it. In no particular order, they are: Moog's Minimoog, Roland's Jupiter 6, Jupiter 8, Alpha Juno and Juno 60, and Korg's MS20. These fine instruments form the basis of Diva's oscillators, filters and envelopes, with a few judicious tweaks here and there. Although the elements can be swapped freely, Diva's purpose is not to impersonate any one synth specifically. The interface is set in a tasteful maroon panel with wooden end-cheeks and in resolutions to suit any monitor. The mouse has to move an unexpectedly large distance before an oscillator switches octaves, but other than that, there was nothing to slow me down and I was soon whizzing about. A double-click sets any control to its default value and, for the mouse‑shy amongst us, a basic MIDI learn system enables assignment of external controllers, adding tactility to the Diva experience. The lower section features five buttons that reformat the panel immediately above to juggle features less related to hands-on tweaking. Check out the Trimmers section, with its subtle individual voice detuning warming up this Jupiter 6-based patch. The most complex of the oscillators is the Triple VCO. Essentially, it's a Minimoog oscillator bank with extras. It's also the Diva component that occupies the most screen space, its Mixer extending over the area otherwise available to the high-pass filter. Extras include synchronisation of VCO2 and 3 and a series of switches enabling pitch and shape modulation, one switch for each oscillator. The waveform selector offers a continuous blend between available waveforms, unlike that of the Model D Minimoog, and this blend may be modulated, its default source being LFO2. Modulating the shape between square and narrow pulse produces a most un-Mini-like (and slightly pitch-wavering) PWM. There are two generic LFOs available regardless of the oscillators selected, so you never need to draft in VCO3 as a modulation source. Indeed, you can't. Nor can the Triple VCO achieve the other Minimoog trick of modulating by noise, because the two LFOs don't have it. However, it's important to understand that this is not a 1:1 Minimoog emulation, even though some aspects are delightfully close. For example, I was impressed that the Detune control prevented the oscillators from perfectly soft-sync'ing together. Two oscillators, when mixed, create a rich and swirly lushness — very like a real Mini. Next, and returning to the unexpected, the Triple VCO sports an FM control, with VCO1 acting as modulation source. The last item I'd like to draw your attention to is the Mixer's feedback. This is also available as a panel in the HPF section, and mimics the effect of feeding the Mini's headphone output to its filter input. The resulting overdrive exudes dirt and instability but feels surprisingly alive. 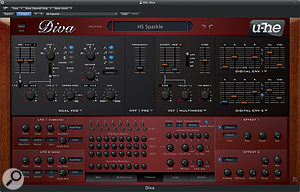 To me, this marked the first suggestion that Diva is indeed more than just another soft synth imitating real hardware. Different oscillator choices are made with the pull-down menu arrow. Being of an eco‑friendly persuasion, I opted for 'Dual VCO Eco'. Based on the Korg MS20, this is the only oscillator to feature a ring modulator. It's very simple, and therefore light on resources, but no less deserving of inclusion. Its pitch can be modulated by two sources — initially Envelope 2 and LFO2 — but, like many of Diva's modulation paths, these can be modified. Clicking on the grey arrow opens a list including MIDI controllers, LFOs, envelopes, and so on. There's more to modulation than just this, so we'll return for a better look later. In the meantime, I noticed that when the default modulation was overridden, the replacement source was shown as if labelled with Dymo tape. Many of my own analogue synths have their fair share of mods, so this ticked yet another 'familiar' box nicely. Of the remaining oscillators, the Alpha Juno version consists of a single DCO with a sub-oscillator and noise. As per the original instrument, it's a bright, brash oscillator notable for offering 'pulse width' modulation of square and sawtooth waves. Perhaps Roland had the Supersaw concept in mind well before the JP8000! The final oscillator choice is the beautifully specified Dual VCO which, in common with the two Jupiter synths mentioned, offers oscillator cross-modulation, sync and the selection of simultaneous waveforms. Also found here is the Shape parameter, which imitates the various Jupiter hardware revisions; its effect is most obvious on the shape of the triangle waves. The results may be viewed on Diva's oscilloscope. According to the manual, all synths need one, and it's undeniably interesting to see the many subtle variations of waveforms at different pitches. Diva includes a scope, so you can see the waveforms this Minimoog patch generates. After the oscillators, there are two filter choices to make, or one if you opted for the Triple VCO. First comes a High-pass Filter section which, although shown before the VCF on the panel, can appear before or after it in the audio chain. The available HPF selections are: Bite, Post, Pre and simply Overdrive, this last plucked straight from the Triple VCO. Providing the greatest tonal coloration is Bite, based on the MS20 filter. Here it's presented in Rev 1 and Rev 2 versions and, while I can't speak for the accuracy of the Rev 1, the Rev 2 does have a snarly bite very close to an MS20. Moving on to the main event, the VCF choices are Bite, Multimode, Cascade and Ladder. Once again, Bite represents the MS20, and again appears in two revisions. This is a superb, cuttingly distinctive filter, particularly sensitive to input level in its response. At high levels, a brash, overdriven tone is produced. It also incorporates FM (using VCO1 as source), so if paired with an oscillator that can generate noise (from an MS20 or Jupiter, say), this already aggressive filter can be deliciously, but realistically, driven insane. Frying bacon a speciality! The Multimode filter is a decent approximation of the Jupiter 6's, its band-pass setting especially close. The Cascade filter emulates that of its bigger brother, the JP8. Setting it to 'Rough' adds a marked instability (like a sheen of high-end excitement) to the resonance. In its 12dB mode, the filter is lighter and brighter, making it ideal for many polyphonic duties. I found this to be one of Diva's best all-purpose filters; warm, clean and able to cover most bases easily. Last, but not least, there's the Ladder filter. Deep and squelchy, this filter will deliver sublime and convincing Minimoog patches time and again, — or select its a 12dB mode for a lighter touch. Uhe make much of the zero‑delay‑feedback of their filters, which, while being resource-hungry, spark and burble with uncanny realism. Digital models of filters invariably struggle with accurate resonance portrayal and tackle its complexities in a variety of ways. If filter feedback is calculated on a per‑sample basis, it introduces significant amounts of latency even at high sample rates. Diva's approach is based on prediction, analysis and correction, but however the runes are cast, the end result is the eerie feeling that analogue synths have possessed my Mac. Which is fab, if slightly unsettling! The envelopes are the final interchangeable component, but very important when it comes to authenticity. This is where so many digital synths fail, and it's a topic I bore my friends with way too often. Happily, whether it's the fast and snappy envelopes of the Minimoog or the digital and rather odd envelopes of the Jupiter 6, the shapes and characteristics feel natural here. Thus, in monophonic mode I can set a long attack and release on the Minimoog ADS envelope and play until it reaches maximum volume. If I release a key, then play again immediately, the envelope remains close to its maximum level. If I leave a longer gap before playing, the sound is naturally quieter, simulating the gradual discharge of capacitors. After blissing out to that simple but often-overlooked behaviour, I wondered why on earth Uhe had swapped the familiar configuration of the envelopes around. Bizarrely, Envelope 1 is the default for VCA control! If you're constructing Jupiter or Minimoog patches, this is needlessly confusing. The other downer is that the envelopes are calibrated in arbitrary units rather than milliseconds and seconds. The tiny button marked C (Curve) in Diva's digital envelope is the only way to adjust envelope shape, and even then only slightly. If, in a future revision, the user could individually shape each envelope stage, I, for one, would be in heaven! The envelopes feature a tailorable velocity response and Jupiter‑like keyboard scaling, so higher notes are shorter than low ones. I mentioned earlier that the LFOs are not taken from any of the source instruments, which is a shame, given that the MS20, in particular, had such a brilliant LFO, with its continuously variable waveshape. They are well thought out, though, and include MIDI clock sync and built-in modulation of their rate and depth. Finally, there are two sets of stereo effects arranged in series. As none of the synths that were Diva's 'inspiration' were stereo instruments, the effects add a convenient extra lushness. They're fairly plain fare — a choice of reverb, chorus, phaser, delay and rotary speaker in both effects — but it I was only disappointed by the delay. It's less than intuitive because, like the envelope stages, delay times are shown as a series of numbers from 1 to 16, where 4, for example, represents four semiquavers. As I care little for these partially-aroused cheesy snacks, I'm dearly hoping Uhe will tweak the way the clock divisions are shown. Life's too short to have to calculate the number that represents a triplet delay or a dotted 16th. For an extra treat, it would be lovely to have an option for un-sync'ed delays shown in milliseconds too. Diva has something I've long desired. No, not Natalie Portman's phone number. I'm talking about individual voice detuning — on a per-oscillator basis. You can spot this on some of the factory patches that sound like a Jupiter just before you hit the Tune button. It's a good thing, really, and to discover how it's done, click on the Trimmers tab. There you'll see oscillator detuning for eight separate voices (voices 9-16 share the same values), plus a row of eight knobs called the Voice Map Modulator. This marks further steps towards true emulation of an analogue polyphonic synth in which every voice is unique. This incarnation is rather basic, but darn good fun. As a simple example, supposing you wanted your synth to have a couple of voices that were slightly brighter than the rest? If you programmed a positive offset for two VMM knobs, then selected Voice Map as the filter's modulation source, each time those voices were triggered, their filter would be opened wider than the others. This might not sound too radical but, when applied thoughtfully, it can make a huge difference to a patch's character. Other means of boosting 'analogueness' include Slop and Drift. Slop adds variations to pulse width, filter cutoff, and envelope and glide times, while Drift introduces pitch wobbles for slight instability. There's also a separate glide offset available to VCO2 — yet another sweet nuance. And if you're a lushness junkie, voices can be stacked. Then, using the Voice Map, you can change the panning of individual voices, creating spacious spreads even before hitting the effects. Around this point, I noticed an issue with one of the voice allocation modes, Poly 2. In classic polyphonic synths, this allocates voices starting at the first, rather than constantly stepping through them as notes are played. The value of Poly 2 was thus in 'mush restriction', but it also had the advantage that you always knew which voice was active. Diva gets this partly right, but does not reliably start on the first voice. This is mainly an issue if you hope to use the Voice Map Modulator intuitively. Hopefully it will be addressed in a future update. Otherwise, I found much to like when exploring the avenues of modulation. The Modifications menu adds fresh modulation paths for parameters such as resonance, feedback and cross-mod depth. Whenever you activate one of these, a small 'M' appears on the panel as a reminder that under-the-covers action is occurring. The modulation sources can also be transformed in various ways. For example, there's a simple lag processor to slow down abrupt transitions and a multiplier to mathematically combine two sources so that they can be treated as one. Such computational treats mean that although you're working with models of old and sometimes limited machines, there's more depth if you need it. If not, it's conveniently out of the way. In case you hadn't already gathered, Diva sounds fantastic, and the 1200 or so factory patches are a vault of analogue richness you can easily lose days in. Divided clearly into categories, they capture many of the best characteristics of the synths they're based on. Some of the Third Party entries even go as far as reproducing classic factory patches — there's confidence for you! There's too many sounds to easily sum up, but suffice to say that it's all here. Those seeking warm bass with incredible presence, or slightly wavery synth brass, won't be disappointed. If your taste runs to deliciously liquid, resonant solos, or filthy aggression to make a nun wince, no problem. I was bowled over well before I started making my own patches and really fell in love. Uhe make no bones about Diva's hunger, and supply a number of suggestions to keep her from breaking into a tantrum. I absolutely recommend using the 'multi‑threaded' option unless you have an old computer, as this spreads the voices across multiple CPU cores. Experimentally, I turned it off once when playing polyphonically and the results were downright nasty! If you switch modes from Divine to Great, there is an appreciable drop in 'aliveness', especially in patches that indulge in resonance, feedback or cross-modulation, but in many cases the results are still, well, great. To better appreciate the zero-feedback filters, try turning to Draft mode and checking out the effect of resonance. Instant memories of my Roland JD800 — yuck! I tended to use patches with a maximum six or eight notes of polyphony, but found that multiple instances could be a problem. Four polyphonic Divas were asking for trouble on my system, but I got away with three, depending on patch complexity. In such cases you'll be glad of offline mixdown. Diva is startlingly good. While a computer and controller keyboard will never match the immediacy, simplicity and individuality of a gradually decaying box of transistors and capacitors, Diva represents another step closer to bottling that essence. Its greatest strength is in the familiarity of both sound and response, and while it's not possible for every parameter to match every Jupiter 6 or MS20 (because even different models vary — often hugely), the programming experience feels authentic, and that counts for a lot. 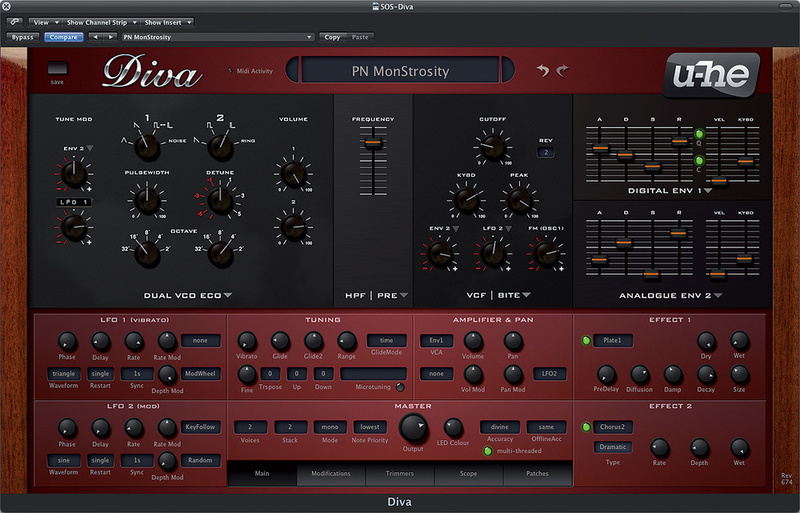 Yes, Diva is demanding, and depending on your computer and the number of instances you want to run, you might need to play in a lower-quality mode and render offline to gain the best resolution. But it's worth it, and I suggest trying the demo on your system to see how it handles. There are a few areas that still need work. An arpeggiator is notable by its absence (how can you have a Jupiter 6 or 8 without one? ), but I'm told that this is top of the priority list for the next version. Similarly, Poly 2 mode would benefit from another look, and it would be great to be able to swap the envelopes around, for those of us who would prefer that. I'd love to choose envelope times in seconds and have a simpler system for tempo-sync'ed delays too, but all these are quibbles, not show-stoppers. Getting carried away for a moment, I'd also be fascinated to hear Uhe versions of the Oberheim SEM and maybe the Yamaha CS80, but that doesn't mean I'm not very satisfied with the quality of what's already on offer. Thoroughly recommended! The closest alternative I can think of for believability and accuracy is the collection of Synth Squad instruments from FXpansion. While also excellent and hungry, this collection is split into different instruments, each with a new interface to learn, and effects are added via a separate plug-in, which I find less convenient. Highly convincing analogue sounds and behaviour. Borrows heavily from classic synths whose components can be mixed and matched freely. The result is a hybrid that's instantly approachable, yet with plenty of depth. Some odd decisions slightly spoil the feeling of familiarity. Requires powerful computer for the best results. Diva will sing beautifully for her supper, but requires a little pampering. 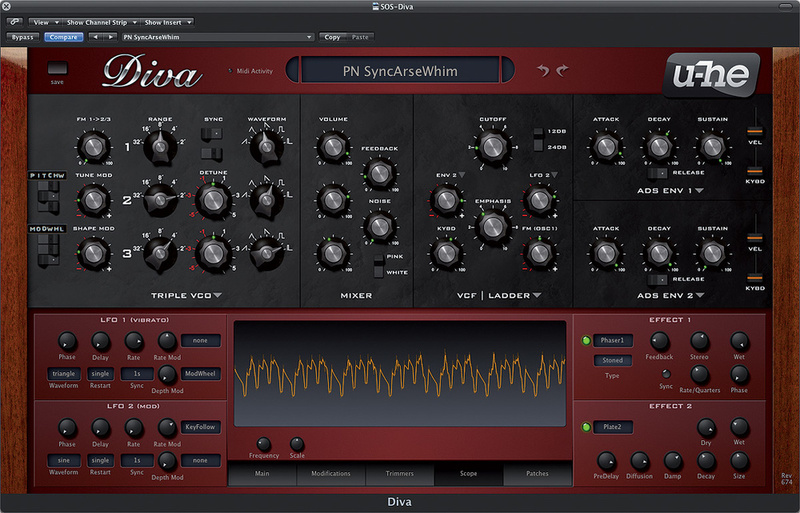 If you're looking for a realistic analogue experience in plug-in form, Diva's up there with the best. Apple Mac Pro running OS 10.6.8, 12GB RAM, 2 x 2.66GHz quad-core Intel Xeon CPU running in 64-bit mode. Apple Logic 9.1.7 in 64-bit mode. 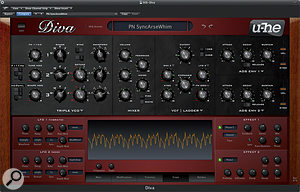 Diva runs as a VST or AU plug-in and does not run in stand-alone mode. RTAS support is planned for later this year.